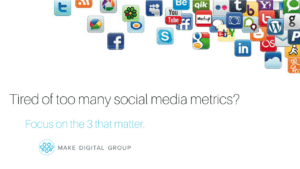 Before jumping into which metrics are vital, let’s first establish what social media metrics even are. According to TechTarget Network, social media metrics are described as the use of data to gauge the impact of social media activity on a company’s revenue. Reach measures the spread of a social media conversation and the range of influence your content is having. At a very basic level, reach is the number of people that have seen your content. On Facebook, for example, “total reach” is the number of people that have seen your post. Your post reaches someone when it’s in their newsfeed. Total reach is broken down into organic, viral and paid. Organic reach is the number of people who saw your post on their feed. Viral reach is the number of people who saw your post published by a friend. Paid reach is the number of people who saw your post from an ad. Engagement is the number of interactions with your content as a whole. It’s how people are participating or engaging in the conversation and what they are doing to spread your content. Engagement has historically been a common metric for evaluating social media performance but doesn’t necessarily translate directly to sales. Engagement can break down to the number of public likes, comments, and shares, but for each social platform, it differs. For Facebook, you will most likely be getting reactions like likes, comments, shares, and followers. For Twitter, re-tweets, favorites, and followers and for Instagram, likes, and followers. Best practices for engaging users consist of posting frequently, using images, being personal or relatable or promoting contests in your posts. You’ll also want to listen to what people are saying about your brand and act accordingly. Influence is an individual’s ability to affect other people’s thinking through an online social community or platform. It’s considered as, who’s talking about your brand and what kind of impact do they have? These days more and more people are looking to “influencers” to make their decisions for them. For example, if a popular make-up artist influencer is testing and rating a new product and gives it bad reviews, then people are less likely to buy that product. While people won’t want to buy that specific product, influence can have long-term effects on having a negative perception of that brand as a whole. Social media is quickly becoming the most essential form of marketing for a company. You must handle social media in an effective way in order to produce the best results, thus bringing you the most revenue. Let’s move on to why this data is so imperative and how you can interpret it to bring your business the big bucks. First and foremost, these statistics can help you discover which social outlets are affecting your business – whether this is Facebook, Twitter, Instagram, LinkedIn, Pinterest, etc. The list goes on and it varies from business to business. After you know what platforms you want to measure on then you can begin analyzing the metrics. This means gaining insight on which content is achieving the highest amount of views. Knowing this confirms what you should focus your time and energy on. It’s all kind of a chain reaction – knowing what content has the greatest appeal is what can set you apart from other businesses. Once you know this, your posts will create more conversations, interactions, and shares which will then deliver a higher revenue. It is essential to be aware of the way desired clients are perceiving your business. This way, the user will take interest in your post and likewise, interest in your company. While knowing the status of your social media marketing is important, taking advantage of social metrics also informs you of your standing in reference to your competition. You can easily analyze the posting strategies of your competitors and use this information to improve your own tactics. Using social media metrics is extremely significant in the success of your business’s social marketing strategies.